A good cozy cardigan is one of my favorite item to wear in the chilling cold day around the house. They are not only easy to make but also stylish to mixed and match with any jean and dress. So I called them “Pretty me oversize chunky cardigan” . They are made up from one piece of rectangle with chunky yarn and 6 mm crochet hook. 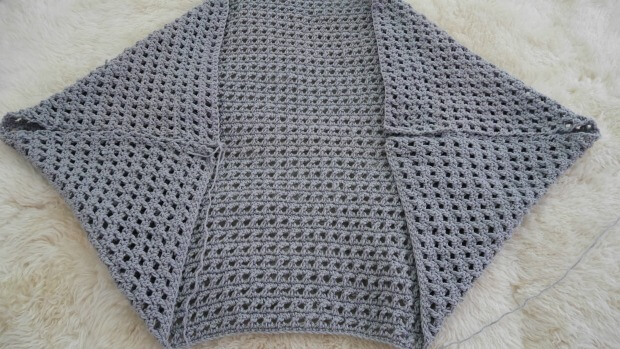 This pretty me cocoon cardigan made in beautiful grey color that everyone love. 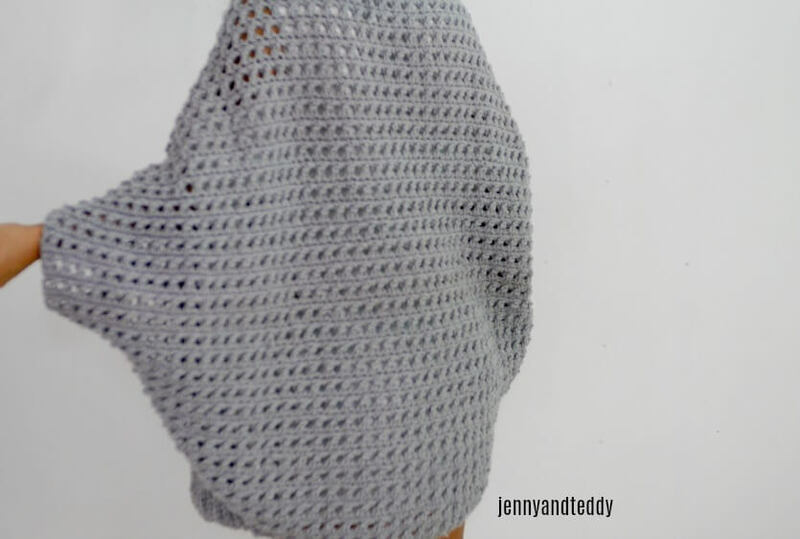 – I used Lion brand Wool Ease-chunky yarn or Brava Bulky Yarn from knit picks for non wool it made from 100% acrylic. Yarn weight 5 chunky about 8-9 skein. Chain 2 (counts as double crochet),Turn, *skip first stitch, double crochet into next, then go back to the stitch that we just skip and make double crochet into this stitch *, this will creating the criss cross*, repeat* this to the end. double crochet into last stitche. Finished Size Approximately: one size fit all adult from small to large. Pretty me oversize chunky cardigan instruction. Start of by making a slip knot Then make 112 chains foundation chain. Row3. make 1Sc in each space across until end of the row. Repeat row 2 and 3 until your rectangle measures approximately 43 inch wide and 29 inches long then finished off and leave long tail for sewing. Lay the piece of rectangle in flatted and fold each corner inward until they meet then using your yarn needle to seam the corner with your prefer method ( I used whip stitch) and leaving holes for the arm. For the arm holes I leave my one about 5.5 inch or your prefer length. Start by Place each stitch marker at the bottom front corner of the cardigan. The gap between first stitch marker to the second is about 16 inch wide (see photo below). 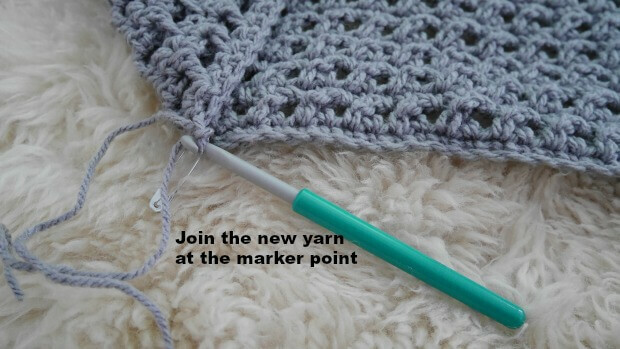 Rejoin your yarn at the first stitch marker is place. Row1. hdc all around the opening of the cardigan start at where the first stitch marker is place and finish at the second stitch marker is place. Row2. hdc in third loop only (camel stitch) all around the opening of the cardigan start at where the first stitch marker is place and finish at the second stitch marker is place. Row3. 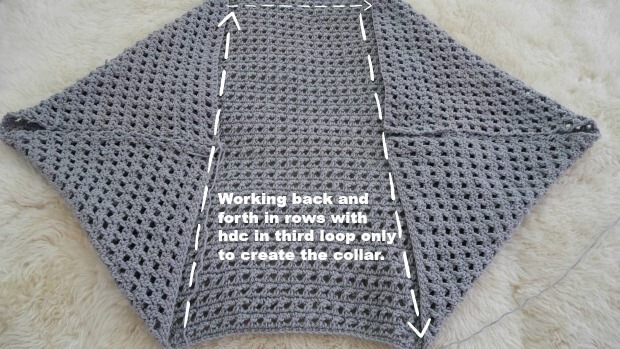 Repeat row2 until your collar measure around 6 inches deep. Fasten off and weave in end. Now enjoy your new Pretty me cardigan. I love this pattern! Can you suggest another yarn with no wool in it that would be comparable? Hi Courtney, for non wool I would recommend Brava Bulky Yarn from knit picks. Can you tell me approximately what size this would be? I assume medium? I would like to make an XL one, about how many inches wide would the first row need to be? I love the simplicity of this pattern, rectangle, I can do rectangle! Thank you so much for posting this. HI Laura, it fit from size small to large. 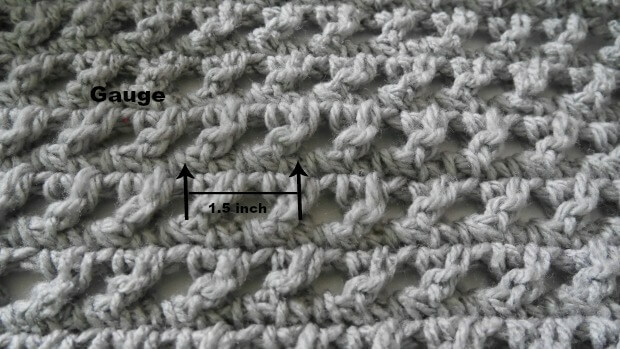 for the guage is 2 criss cross stitch = 1.5 inch. I have add photo how to measure the guage in the post. I just finished this. Used Mainstay yarn from Walmart. 1.97 skein, and only took 5 skeins. Also couldn’t figure out camel stitch and used low ridge front. Looks great. I am larger so I used the span from fingertips and size was perfect. I just kept trying it on for length. aww that so sweet of u Debbie. Thanks for making it so pretty. Gerttng ready to start this cardigan and have a question on the collar. When you get to the second row do you fasten off at the second stitch marker and then rejoin yarn and then start again at the first stitch marker or do you keep tuning and then go back up to the start, turn etc. .Guess my question is do you fasten off at the end of each row or turn and go back around. Hi Wendy, on the collar when I get to the second row, do not fasten off and then ch1 and keep turning and go back around until finished the collar. I have just started this cardigan, I was just wondering, I have started with an even number of chains (130) and I am one chain short at the end of row 2 for the criss cross double crochet stitch. If I add another chain at the start then I will be starting with an uneven number of chains opposite to what you suggested. Do you have any ideas? if you 1 stitch short just made dc in the last stitch at the end of the row. hope this help. 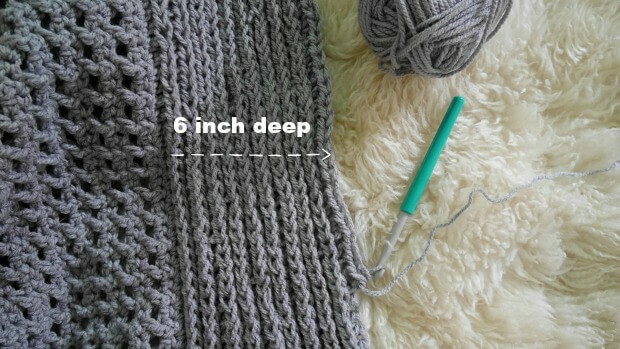 HI Jean, the hook size would be 5 mm for yarn weight 4, this way will make the project loosely and more airly, I suppose but the project will take more time than chunky yarn, or you could holding 2 strand of yarn while crochet and use the 6mm hook size. 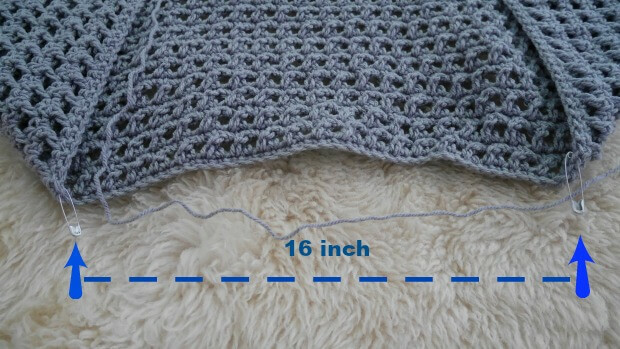 Oh if you mmm… a little bit too hot for the thicker yarn I would recommend for cotton yarn 4 aran with 6 mm hook go well with it. I have yarn which is recomending to knit 6-8mm . Can i use hook 8mm? It then i used less yarn? I want size smal. 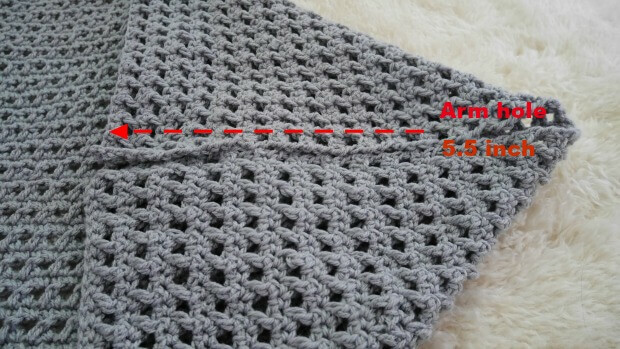 HI Basis, yes you can use 8 mm hook it will speed up the cardigan faster and the definitely use less yarn, for small size you can just simple decrease the foundation chain. Im taller the average, I see how to make it wider, but can just doing more rows will it get out of balance ? Hi Cheryl, yes please add more row they will not get out of balance because when you assembly by flod up each end to meet they will be match, hope this help.